**Click here to skip to recipe**Ok, first thing first is, I know the difference between sweet potatoes and yams (sweet potatoes have a light cream/tan colored skin, yams have the dark orange skin, they have distinctly different flavors when cooked and sweet potatoes are a huge pain to work with because once you peel them they oxidize/turn nasty colors quite quickly). People never call an actually sweet potato a yam, but they do call yams both yams and sweet potatoes. So whatever way you prefer, this recipe involves the dark orange colored skin kind. Secondly, there has been a distinct lack of posts on here over the last couple of months, and it’s not from my laziness or lack of wanting to put recipes on here but from the simple fact that I have been physically unable to develop recipes. The last couple of months have had me down and out with some kind of stomach issues, yet to be diagnosed. It seemed to come out of nowhere and has left me unable to eat pretty much anything I was eating before, especially sweets! Since I refuse to post recipes that I haven’t tried myself, and I can’t be trusted to not eat delicious food in the house if it’s around, there has been no real cooking/backing going on in my house. It’s been awful both physically and emotionally and put an immediate halt to my dessert catering development. I have tests coming up this week and hopefully they will yield some answers, but in the meantime I’ve had to get creative with what I’m eating. It hasn’t been all bad, though, as it was a huge wake up call for me to work on getting my overall health taken care of, including beginning a weight loss and fitness journey. Finding foods my stomach will tolerate that aren’t completely boring and awful, while providing adequate nutrition has been quite a challenge, but I’ve come up with a few delicious staples that have kept me going, including these ridiculously simple yet amazingly delicious yams. They’re a perfect snack for those who like the sweet and salty combo. 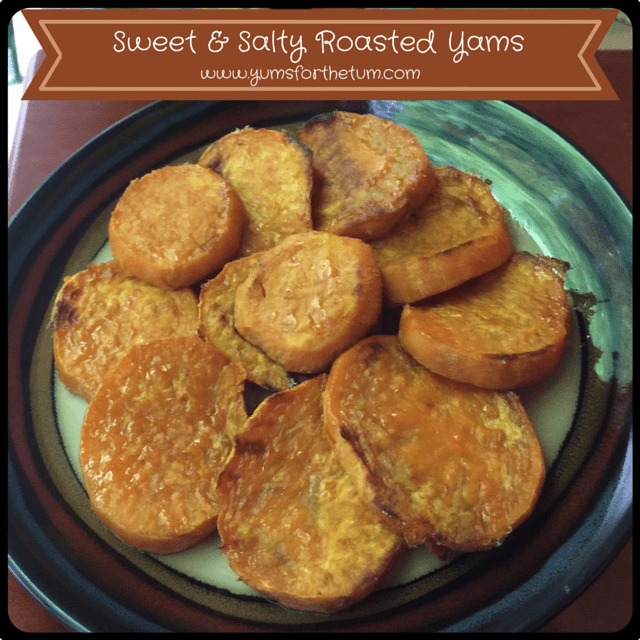 Yams are naturally sweet, and when roasted with some olive oil and sea salt on top they caramelize and create a wonderful sweet and salty combination of flavors. These yams are healthy, easy and delicious and are perfect for an everyday side dish or even for the holidays when you’re looking for a healthier sweet potato dish. These yams are healthy, easy and delicious and are perfect for an everyday side dish or even for the holidays when you're looking for a healthier sweet potato dish. Preheat oven to 400 degrees F, with rack at the top. While the oven preheats, line a baking sheet with parchment paper and peel/slice the yams. Place the yam slices on the parchment-lined baking sheet in a single layer. Bake in the preheated oven for 25 minutes, then remove from the oven, flip the slices over, return to the oven and continue baking for ~20-25 more minutes, until all slices are tender and have caramelized to your liking (you can flip them over again if you need to, in order to get them caramelized to your liking on both sides). Remove from oven, allow to sit for ~5 minutes before serving. Serve hot. I love the taste of these just with the olive oil and salt, but if you want slightly more sweetness, sprinkle a touch of brown sugar over the tops before they bake, which will also help them caramelize. NOTE: For IBS/Low FODMAP - only consume a maximum of 50g (~1+3/4oz) per serving (meaning that weight of the cooked, final product). It will seem like hardly anything, but hey, it's something! Any more than this amount will likely cause symptoms, due to sweet potatoes/yams containing polyols when consumed in larger quantities.